Here Chuck goes into his Randian philosophy of rights and there's much to say that I do not have enough time to go into. This concept of rights supports Chuck's entire philosophy on economics and healthcare. He says that no one has the positive right to someone else's stuff, like money, or labor, but one only has the right to life. The idea that the selling of one's goods or labor for money to buy another person's goods or labor is a strictly voluntary trade, as if it were two people voluntarily trading baseball cards, is not entirely accurate. Though it often seems this way at first glance to many people, the labor market is one where there are dramatic power imbalances. One's right to life is dependent on them eating, drinking, and having shelter, and that means that laborers can't just chose not to sell their services. No one dies from not having a certain baseball card, but everyone dies by not being able to obtain food. This is especially true when it comes to medical care. When one cannot afford the cost of a necessary exorbitant medical procedure, one's right to life effectively ends. So I disagree with Chuck's starting point. I see no reason why it is immoral for a legitimate government to take a percentage of one's earnings to spend on things that are good for the entire population, like healthcare. Without that you'd get a system where market forces would end up killing millions of people like senior citizens, those who are sick and who have rare or expensive medical needs, and the poor—who will never be a part of any company's financial best interests to insure or treat since they have little money and will often have the highest costs to the system. Chuck's system of totally private and unregulated medical care could only ever lower costs by kicking out the people who need it most and leaving the healthy population left over. That means senior citizens and those who are sick and who have rare or expensive medical needs will be routinely denied. That's every insurance companies dream and it would be made possible by severing all governmental oversight of the industry. Then Chuck explains how the Clintonian view on medical care is a "needs based" system where the runaway medical costs were created by three cornerstones: (1) medical licensing, (2) wage and price controls, and (3) Medicare and Medicaid. Here Chuck is literally arguing that we should have no legal standards for practicing medicine. Literally anyone with any experience should be able to prescribe medicine or perform surgery. I suppose the free market alone will determine who's reputation suffers. Where is the evidence the standards are arbitrary? In New York State, where I live, the standards seem pretty rational: complete 60 semesters in a NY State program or equivalent, graduate from a medical program registered by the NY State Education Department, supervised clinical clerkships, proof of education, post grad training requirements — you know, basic assessments of one's competence in the medical field. Chuck would throw all that out the window and legalize the ability for anyone to call themselves a "Dr." People would be able to perform surgery in their homes after watching YouTube video tutorials. What could possibly go wrong Chuck? Saying that medical licensing reduces the number of doctors is like saying that drivers licenses reduces the number of drivers. Yes it does, and for good reason. We shouldn't allow 8 year olds to drive. I'd assume Chuck isn't for 8 year olds driving, but who knows. He's pretty libertarian and the serious ones do think driver's licenses are absurd. Here Chuck describes how during WW2 the US government made companies freeze wage increases due to high inflation. Companies were raising wages because the supply of labor had decreased during the War. So companies offered comprehensive healthcare as a way to lure workers. 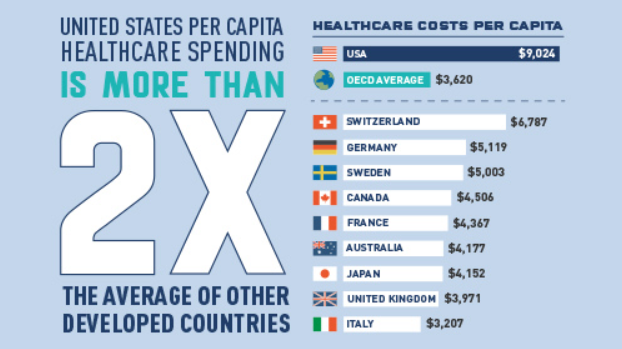 This is why in the US healthcare is tied to employment. I'm critical of this era of US history too, but only because we should have enacted universal healthcare like almost all other Western countries were doing at that time. Chuck's view would entail that the government let wages (and thereby inflation) increase to whatever level the market would allow, even if that resulted in millions of people unable to afford food or basic needs. Following World War II, coercive labor unions made such insurance a standard part of their contracts. The effects resulting from such employer-provided comprehensive insurance are (1) a psychological mindset among employees, akin to that which exists in socialist countries, that medical care is a right of employees that can be provided essentially for free, and (2) an economic situation, akin to that which exists under socialism, whereby all costs are borne collectively by a group rather than by individual people. The way insurance works is by spreading risk. The costs are borne collectively by a group rather than by an individual person by pooling people together. That's how it works. Chuck here seems to not understand the basic purpose of insurance, much like Paul Ryan. So here Chuck seems to take issue with the idea that companies offering healthcare to employees made employees think healthcare was a right given to workers. He seems to prefer the idea that only individuals should buy health insurance and that even employee sponsored health insurance is bad. Wow! Chuck also thinks most people should just buy catastrophic coverage instead of comprehensive coverage, and have no price controls on drugs whatsoever, as we basically have now. On top of that he's arguing that anyone should be able to practice medicine with no requirements. This will ensure most people either cannot afford insurance, or afford enough insurance, or will go to cheap and unqualified people to perform surgeries or diagnose illnesses, which will inevitably lead to people dying or being injured through of malpractice. That's Chuck's solution to the status quo. Brilliant. This wraps up part 1. Stay tuned for part 2 of this critique shortly.